I’m being good this week. I said I was going to make sauerkraut and sauerruben (fermented turnips), and, indeed, I am doing it. I think it took me about 4 hours last night to do all the work, but I did. Part of my impetus was that my half-full jar of sauerkraut (made about 4 weeks ago) fell out of the refrigerator and shattered — big mess, dead jar, no sauerkraut this week! Some raw foodists are concerned about fermented foods. I am on the side of people like Ann Wigmore (pretty much the “mother” of raw food), and others, who think that it is useful to supplement pro-biotics (yes, you could go and buy capsules or powders, but wouldn’t it be nice if you could get the same benefit through your food?) I use New Life All-Flora probiotics to jumpstart my ferments. Some people object to fermented foods as “rotten”, but I don’t happen to be one of them. I understand that, when you ferment raw vegetables, nuts, and seeds, you create a food product that is rich in probiotics and good for you. I had 2 small-ish heads of cabbage in the refrigerator for 2 weeks. When I dug them out and cut them in half, I found, interestingly, that the center of each was going bad, while the outside (about 3 inches worth all around the center) was perfectly fine. I cut away and discarded the centers, and shredded the rest. I shredded the cabbage in my wonderful Cuisinart Food Processor . I put all the shredded cabbage in a large bowl, mixed in 1 tablespoon sea salt, and then mooshed/squeezed it all around with my hands, until the cabbage gave up its juice and was reduced in volume by about 1/2. into @1 tablespoon of water and mixed well. Then I poured the probiotic/water mix into the jar, and used a chopstick to make holes down into the cabbage so the probiotics would go down into the cabbage (I don’t know if this is necessary, but it seems logical, so I do it). Then I put the jar in a bowl and set it in a cool corner of my kitchen (cool? ha ha! It is summer in New York City, and we don’t have air-conditioning. Suffice it to say that I put it in the corner of the stove top — we don’t use the stove, anyway. That is probably the coolest place in the kitchen). That was about 7 pm last night. While I was gearing up to make the sauerkraut, I decided to read through Sandor Katz’s book, Wild Fermentation again. This time, since I had a slew of turnips in the refrigerator, I noticed the “sauerruben” recipe for fermented turnips. I held back from my irresistible desire to add stuff to a recipe since I’ve never tried to ferment turnips, and since Sandor says that plain fermented turnips are delicious, and I made the straight recipe with just one addition – I added probiotics, which I always add to fermented foods because, when I do, my product never ever fails. I honestly can’t tell you how many turnips I used. They were the “Japanese salad turnips” (smallish, all white). These were medium-sized turnips – large enough to make it worthwhile to peel them. I peeled then chopped the turnips. I placed the shredded turnips in a large bowl and added 1 tablespoon of sea salt. I mixed it all around, then squished/mooshed/squeezed all of the turnip/salt mixture, until it yielded a lot of juice and reduced in volume by about half. Then, I placed the turnips in a 1 pint jar. At first it seemed the turnips would not all fit in, but, after a lot of mooshing/pressing (which I did in the sink, in case of overflow, of which there was some), I got all of the turnips into the 1-pt jar, with a little space at the top. into @1 tablespoon of water and mixed well. Then I poured the probiotic/water mix into the jar, and used a chopstick to make holes down into the turnip mix, so the probiotics would go down into the turnips. Then I put the the 2-part lid onto the mason jar (I’ve used recycled jars with plain lids, but the two-part lids of the mason jars are traditional, and you do get some feedback if you use them — as the vegetables ferment, some juice seeps out, which lets you know that your product is successful), and I put the jar in a bowl in the coolest corner of the kitchen, beside the sauerkraut jar. This afternoon, when I came home about 4 pm, I checked the jars, and I was happy to see in that a little less than 24 hours, they had bubbled out about half a bowl-ful of liquid each. That is a good sign. Actually, I have never seen so much liquid bubble out in one day before — it could be because I used 2 caps of probiotics instead of just one — whatever the cause, I am happy, and I am excited. I know that my sauerkraut will be ready in 3 days (although I can leave it for longer — I’ve left it for up to 2 weeks. I suppose I could leave it for longer, but I like the 3-day flavor). After I finish the turnips, I am going to ferment the beets I have in my refrigerator. I am sure they will work like the turnips, so I will already have something to go on at that time (I am imagining that I will add garlic and/or something else to beets) I’m imagining that the beets will turn out to be really delicious. I can’t wait. I got some collards, too. They went immediately into massaged collard salad. The dill went into the dehydrator, because I do not trust myself to use the fresh quickly enough. Green smoothies with the lettuce and turnips, turnip greens and beet greens, plus some tomatoes, and maybe some fruit. I put all the raspberries into one protein shake. I put all the blueberries into one protein shake. I did not have much in the way of fresh food (like NONE) in the house tonight, owing to the fact that, until Thursday, I expected to be on the Master Cleanse for another 3 – 4 weeks. I do have a number of bags full of vegetables I have dehydrated over the winter, and some leftovers from the summer, so….. I dug out my last little bit of wakame (about 1/2 C) and soaked it. I soaked about 1/2 handful of dehydrated turnip. I ground up about a handful of dehydrated red bell pepper slices. I finely chopped 1/2 onion. I also soaked @ 1/2 C of dehydrated parsnips. I combined the wakame with the turnip and the bell pepper powder, and added some garlic powder, olive oil, and apple cider vinegar. To the parsnips, I added some olive oil and a little black pepper. I am going to take the leftovers to work tomorrow for lunch. Yesterday’s was the third CSA Winter Share delivery, and the first one where I have had enough time to catalog what I got. 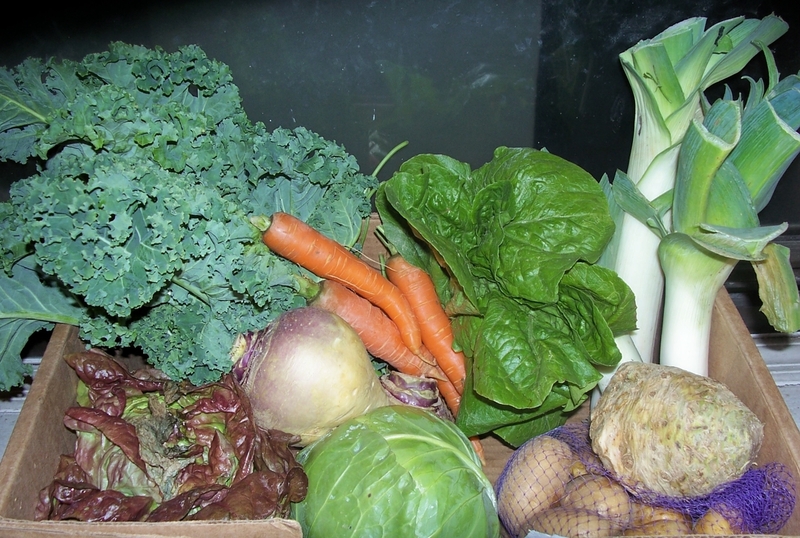 In this winter share, we get 25 lbs of vegetables and “some” fruit. It seems to be mostly the same each time, actually. I also get 1/2 gal. of apple cider. I gave Mrs. Murphy, the elderly lady next door, 4 apples, 3 pears, and maybe half of the potatoes. She has been saying that she couldn’t eat pears because they aren’t soft enough, and this kind that we got are very soft, to the point that they will die after about 2 days. The watermelon radishes are kind of interesting. They almost look like turnips – they are white, and they are quite a bit larger than the red radishes you see in the supermarket. The only thing to really distinguish them from turnips is that the tops are green instead of purple. Inside they are red. They do taste radish-y, though. What does all of this mean, recipe-wise? Well, Thursday night, I spiralized a turnip, a beet, and a carrot, and added them to some soaked hijiki seaweed, sprinkled some of my dehydrated garlic and onion, some Italian spices, and some Spike, added about a tablespoon of olive oil and another tablespoon of apple cider vinegar, mixed it up well, and let it marinate for about a half hour. It was good, even though I forgot to add in the radish I had planned to spiralize. Last night, I ate some more of the mix, but I knew I would not have the heart to eat it a third day in a row, so I decided to see what would happen if I put it in pattie shapes in the dehydrator. I put the mix in the food processor and ground it to applesauce texture, and then spooned the mixture onto teflex sheets, mashed the lumps in to round patties, and left them to dehydrate for about 6 hours. They weren’t dry enough to flip onto a screen, so I left them for 10 more hours. They turned out crunchy and fishy/meaty tasting, with a slightly bitter tang. I like the taste, so I will take them to work for lunch tomorrow. That leaves me with all the beets, all the apples and pears, etc. On Monday I am going to head to the market to see if I can pick up some avocados and onions, to make sushi…. I have nori sheets, and I have heard that parsnips make a credible rice substitute, so I can make sushi (I have some sprouted sunflower seeds I could grind up into a paste if I feel I need some serious protein). I will grate up some carrots and beets and add them, too. I like to process beets and turnips fine in the food processor and add apple cider vinegar and a little olive oil, so I will probably do that for lunch tomorrow, and throw some of the sunflower sprouts on top, just to see what happens when they sit on apple cider vinegared vegetables for 6 hours. I will probably end up finely processing the beets and turnips and dehydrating them for later use in salads and smoothies, and as snacks. I will probably take more potatoes to Mrs. Murphy next week. I know raw potato recipes, but I just never feel like making them. I take that as a sign that they are not good for me. Mrs. Murphy will be happy… she likes mashed potatoes and hashed brown potatoes. Tomorrow morning, I will process about 6 apples and pears to make apple sauce for breakfast, and I will take what I can’t eat to work for a snack. Tomorrow night, I will probably process about 10 apples and pears to make juice. The next delivery will be in 3 weeks, so I have plenty of time to figure out how to eat everything. Since this coincides with my rent check, I will have plenty of chances to be creative, since money for any other groceries will be scarce. Perhaps I will learn to make soups. With this many beets, I could probably make borsht. Celeriac is something new to me. Someone said I could chop it raw into a salad.